A Sweet New Year happens in many ways, but this year it happened in a way I’ve never experienced before. On September 14th, my grandson, Ronen Baker Lyon, was born to my son, Jeremy, and his wife, Melissa (Mimi). Though he was due the day after Yom Kippur, he arrived between the Holy Days, which gave Lisa and me time to travel to New York City, and welcome him into the world and our family. I was told that being a grandparent is like nothing else in the world, but I couldn’t have understood it until it happened to me, personally. In the hospital, my son held his son; or, should I say that my baby held his baby. It was surreal. Before my eyes, my son became a father. Ronen hasn’t had a fussy night (that I know about), but Jeremy and Mimi are already demonstrating unconditional love and patience. B is for Befriend, don’t Belittle. My son isn’t just the boy I remember; he’s a father now. It’s important to honor him for who he is rather than telling stories about how he was as a child or a teenager. I didn’t belittle him when he was young, but he would feel infantilized by me if I spoke of him in the past. We’re best when we’re adult friends, together. C is for Confirm, don’t Criticize. Be a non-anxious presence. Even if the new parents get it wrong the first time, their intention is to get it right. Give them room to grow and make their own mistakes. Confirm their love and patience. Validate them in their new role as parents. Don’t only say, “Good job.” It’s judgmental; it feels like you’re grading them. Don’t only say, “I told you that my way was easier,” because they’ll grow to resent you. Do say, “You’re a natural” and “You figured it out all by yourself.” They’ll welcome you back every time. I’m sure there’s a “D” and “E” but no one likes too many rules. Lisa and I will do as we’ve learned from many of you, which is to begin with love and to end with love. No problem there. 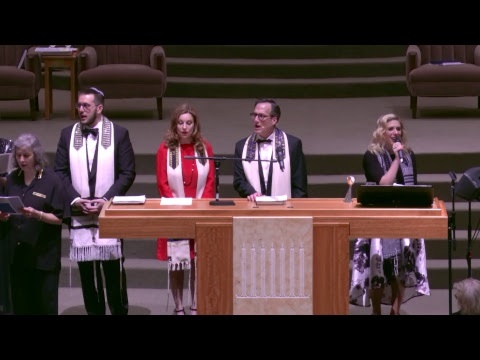 In the near future, we’ll see Ronen and his parents in Houston, and invite them to the bimah at Beth Israel. There, a very proud grandfather will bless his grandson in the company of family and friends like you. Lisa and I look forward to sharing our “naches” with you and the blessing of our grandson…L’dor vaDor, from generation to generation.